uMotif - News - Cloudy with a Chance of Pain is Front Page News! Cloudy with a Chance of Pain is Front Page News! Our collaboration with the University of Manchester is featured on the FRONT PAGE of the Daily Express today (1 December) - describing preliminary findings from our world-leading study 'Cloudy with a Chance of Pain'. 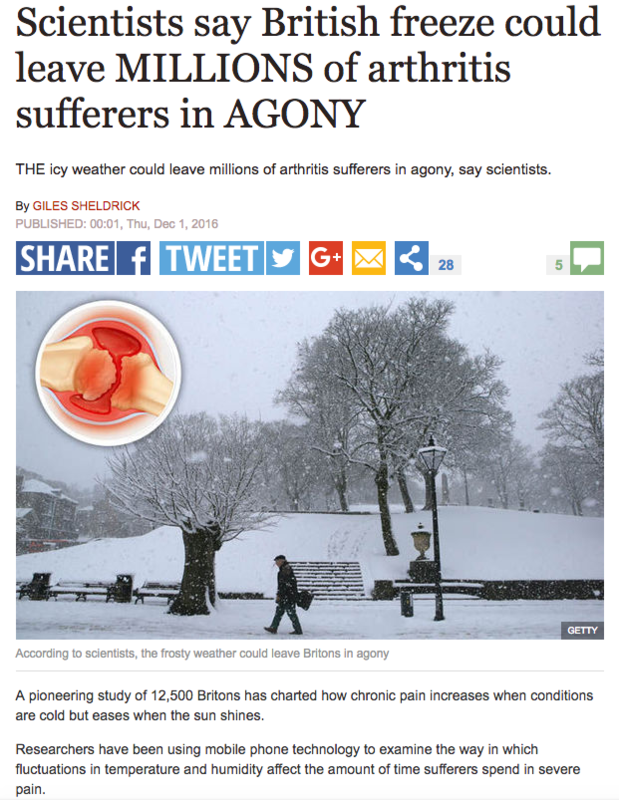 With over 12,500 patients taking part and millions of data points captured, the initial analysis shows that the weather may influence the symptoms of those with chronic pain or arthritis. As the winter sets in this week, and temperatures plummet across the UK, the findings have attracted additional interest. This is just the start of the analyses from Cloudy with a Chance of Pain, and we're excited to see the initial findings appearing in national media. The Cloudy study is a perfect example of uMotif's philosophy - that digital solutions for health data capture need to move "beyond the clipboard", to fully leverage the capabilities of today's technology and not simply replicate their paper ancestors. In the case of Cloudy, we're powering new forms of data capture at high frequency, giving the Manchester team the ability to correlate local weather conditions captured by participant's smartphones with pain scores they record through the uMotif platform.